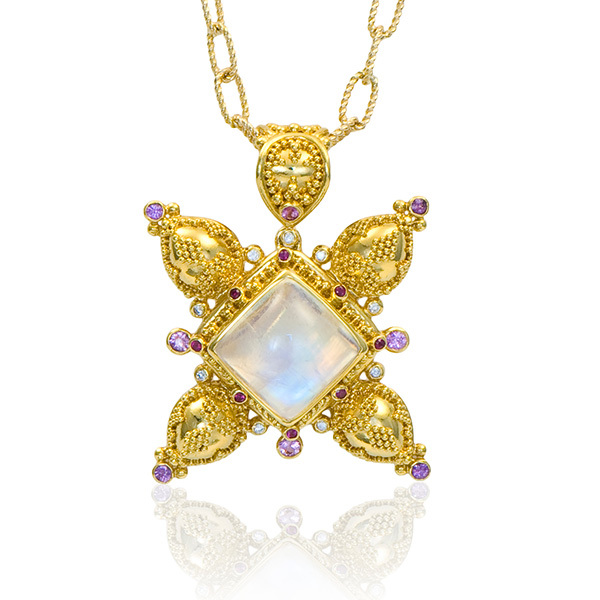 Pendant is set with an oval Moonstone (9x7mm, 2.21cts), round rose-cut Moonstones (2.40tcw) and Diamonds (.18tcw) in granulated 22kt yellow gold with 18kt yellow gold. 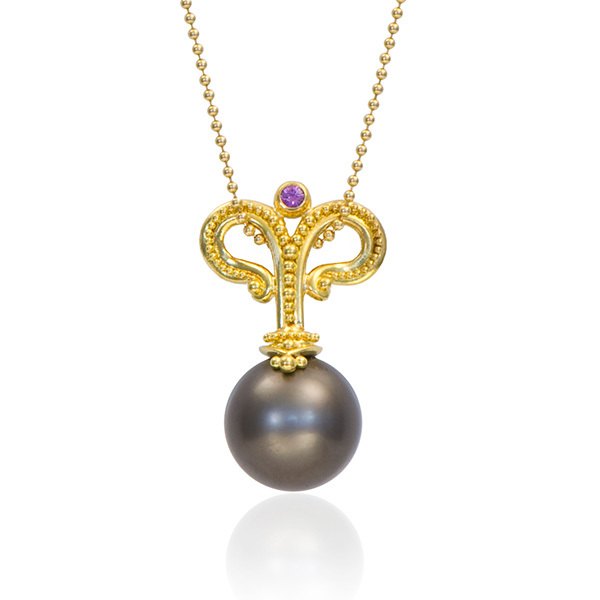 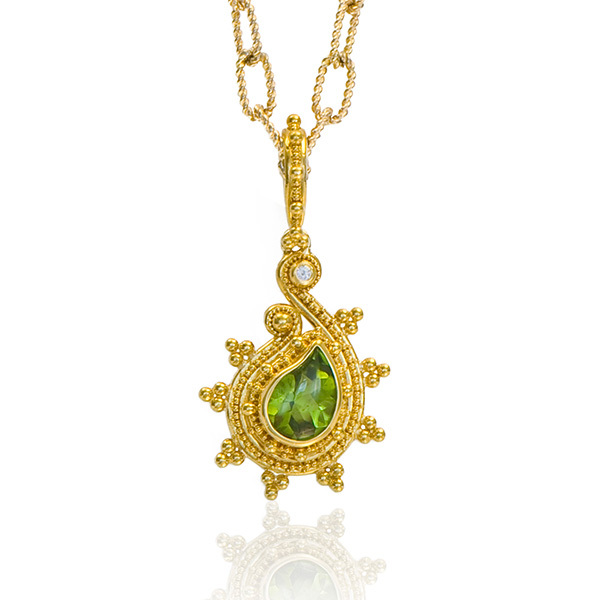 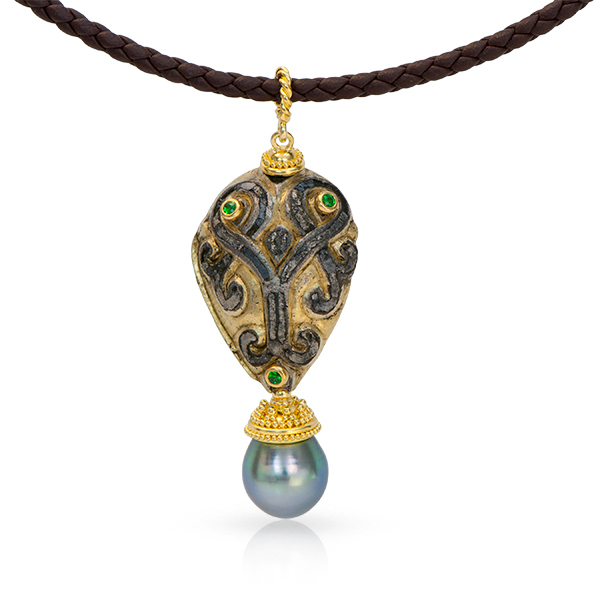 1 7/8″ L x 1 1/4″ W.
Pendant is set with a Medieval Silver-gilt Mount (12th-14th century), Tsavorite Garnets (.15tcw) and a Black Tahitian Pearl (11.5x14mm) in granulated 22kt yellow gold with 18kt yellow gold, 2 1/4″ L x 7/8″ W x 3/8″ D.
Pendant is set with a White Freshwater Pearl (15x35mm), Pink Spinel (4x6mm, .60cts), Purple Sapphires (.11tcw), Hot Pink Sapphires (.06tcw) and Diamonds (.03tcw) in granulated 22kt yellow gold with 18kt yellow gold. 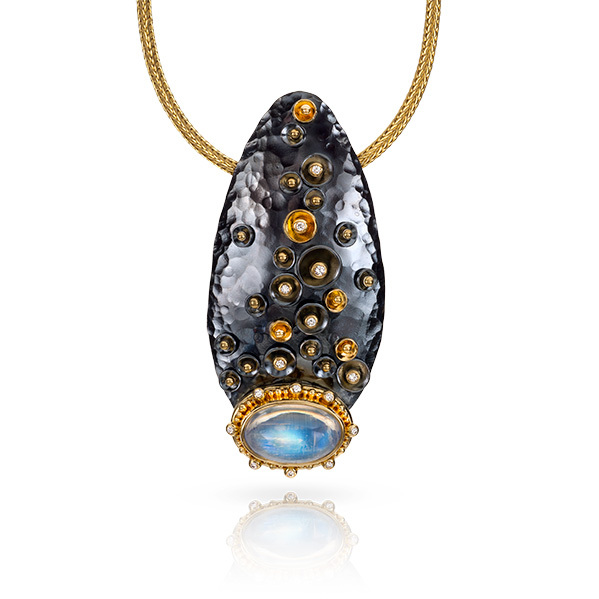 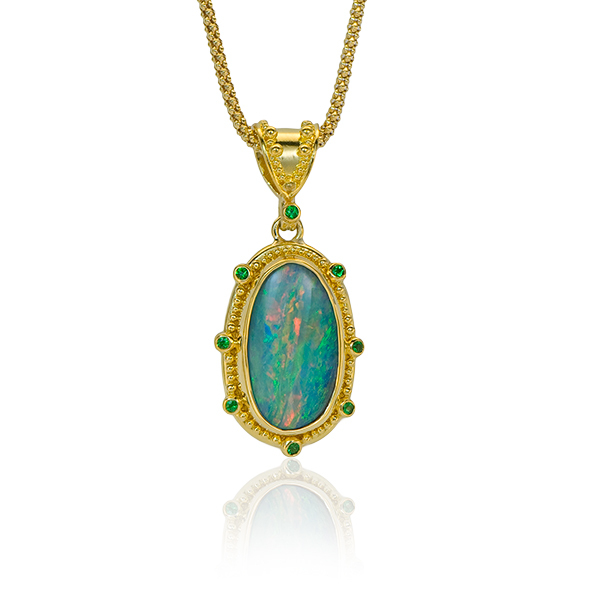 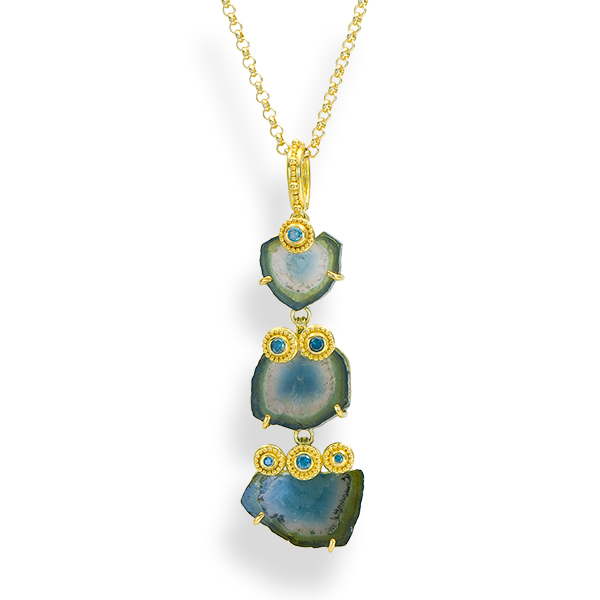 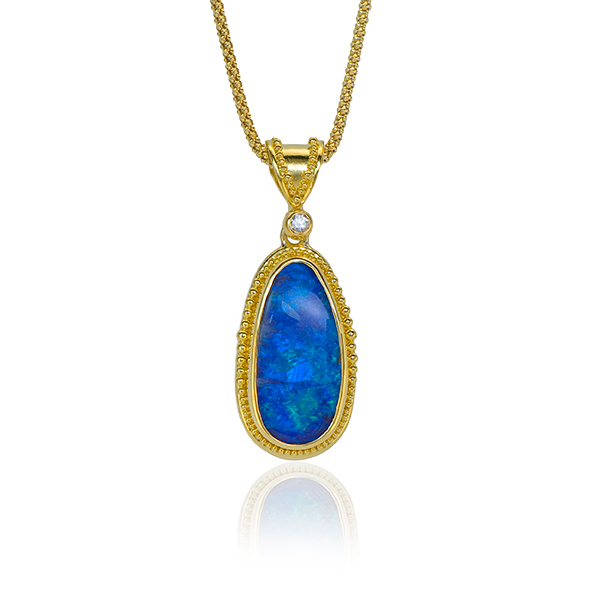 2.75″ L x .75″ W x .5″ D.
Pendant is set with an Australian Boulder Opal (9.67cts, 12x24mm) and Tsavorite Garnets (.18tcw) in granulated 22kt yellow gold with 18kt yellow gold, 1.5″ L.
Pendant is set with an Australian Boulder Opal (8.04cts, 20×11.5mm) and a Diamond (.07tcw) in granulated 22kt yellow gold with 18kt yellow gold, 1.5″ L.
Pendant is set with an Australian Boulder Opal (15.30cts, 29x14mm) in granulated 22kt gold with 18kt yellow gold, 1.875″ L.
Pendant features three Blue-Green Tourmaline Crystal Slices (23.30tcw) and Teal Diamonds (.31tcw) in granulated 22kt yellow gold with 18kt yellow gold, 2.5″ L x .75″ W.
Pendant is set with a Medieval Silver-Gilt Mount (dating from the 12th-15th century), a faceted Red Spinel (.13cts) and Red Spinel bead in granulated 22kt yellow gold with 18kt yellow gold, 2″ L x .5″ W.
Pendant is set with a Medieval Silver-Gilt Mount (dating from the 12th-15th century), Blue Sapphire (.13cts) and a Kyanite bead in granulated 22kt yellow gold with 18kt yellow gold, 1.75″ L x .5″ W.
Pendant is set with a Medieval Silver-Gilt Mount (dating from the 12th-15th century) and an Aquamarine bead in granulated 22kt yellow gold with 18kt yellow gold, 2.25″ L x .625″ W.
Pendant is set with Lapis (24.33cts, 19.2×25.7mm) in granulated 22kt yellow gold with 18kt yellow gold, 1 5/8″L x 7/8″W. 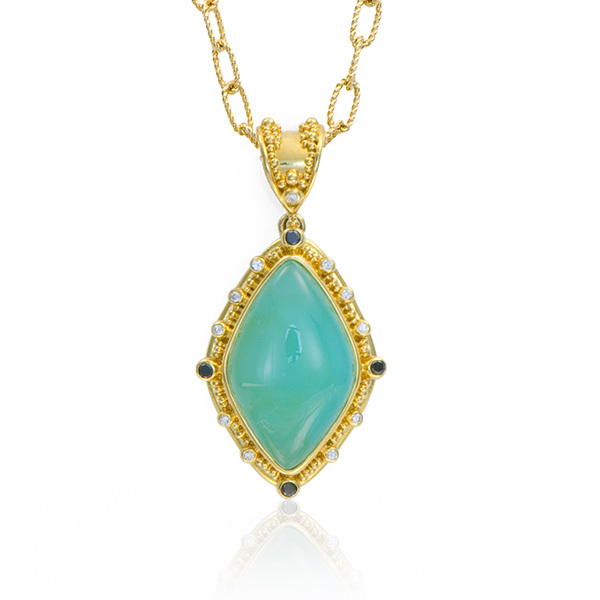 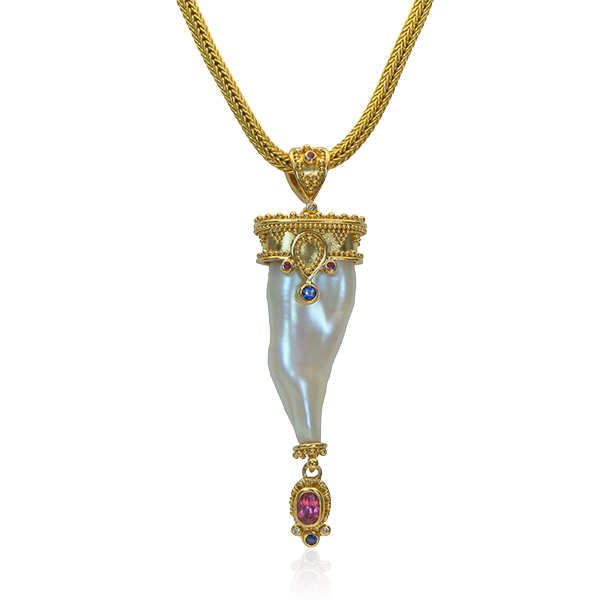 Pendant is set with a Moonstone (20.75×13.85mm, 17.17cts), White Diamonds (.06tcw) and a Teal Diamond (.07tcw) in granulated 22kt yellow gold with 18kt yellow gold, 1 1/2″L x 3/4″W. 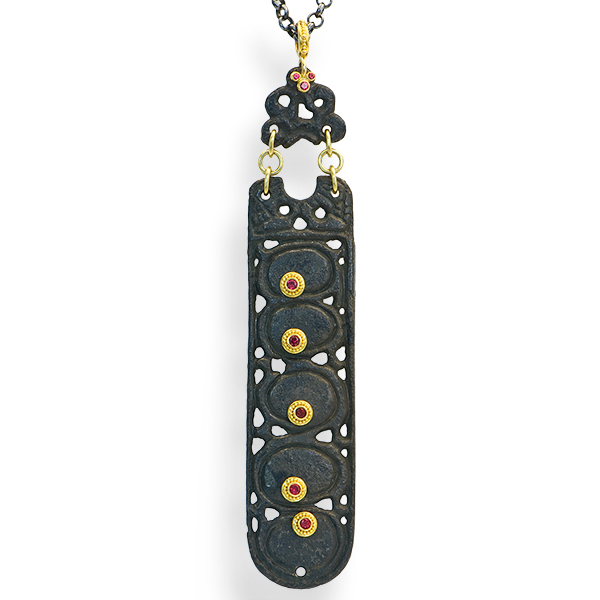 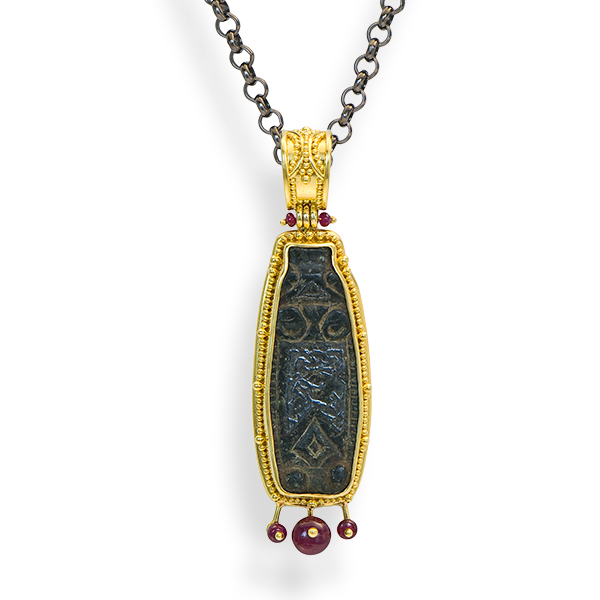 Pendant is set with a Viking Gilt-Bronze Belt Mount dating from between the 10th-13th C. and Diamonds (.16tcw) in granulated 22kt yellow gold, 1 1/4″L x 1″W. 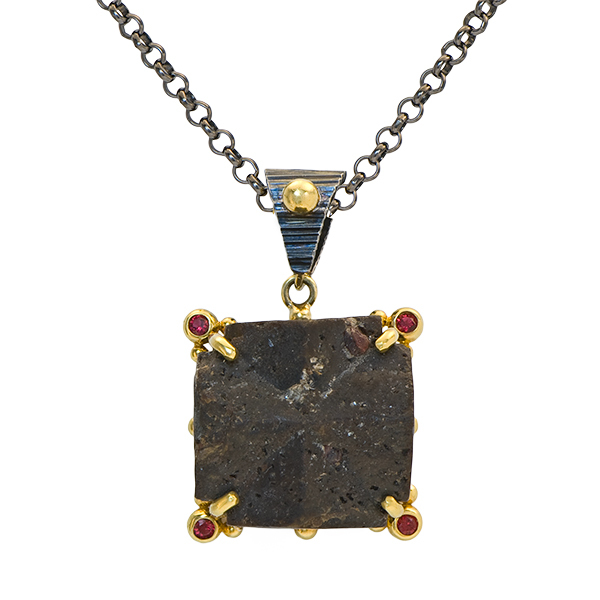 Pendant is set with a Staurolite “Fairy Crystal” (a naturally twinned crystal) and Red Spinels (.24tcw) in granulated 22kt yellow gold on a forged and oxidized sterling silver frame. 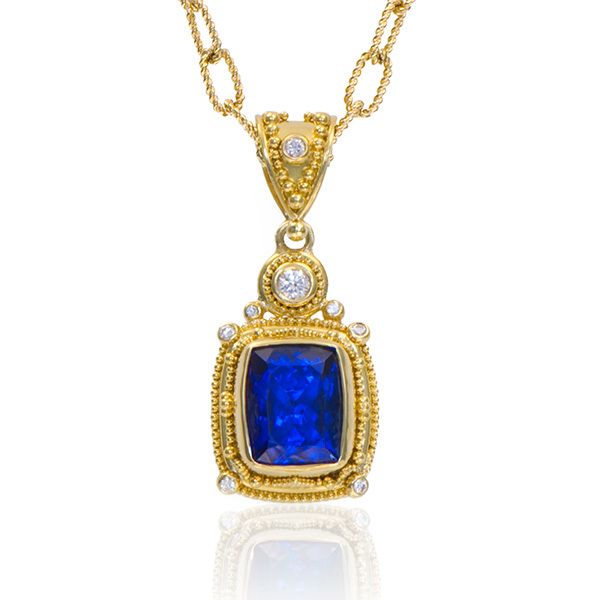 Pendant is set with a heritage* Tanzanite (10×12.3mm, 8.46cts) and Diamonds (.23tcw) in granulated 22kt yellow gold with 18kt yellow gold, 1 1/2″L x 3/4″W. 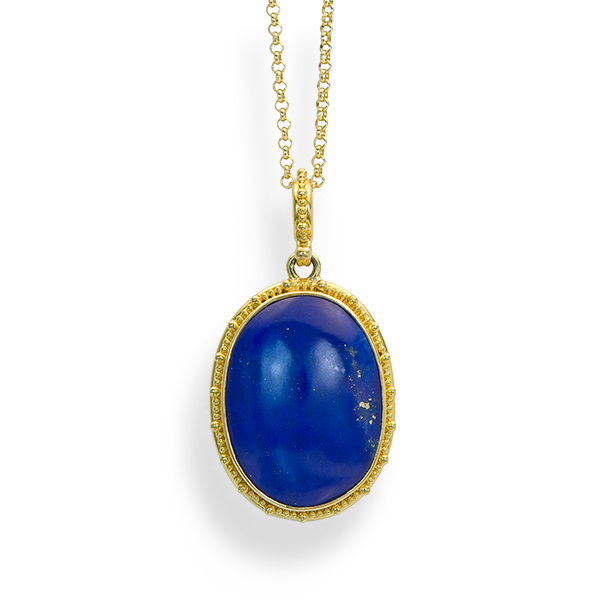 *This stone comes from a pre-1970 collection, purchased when Tanzanite was first discovered and introduced to the market. 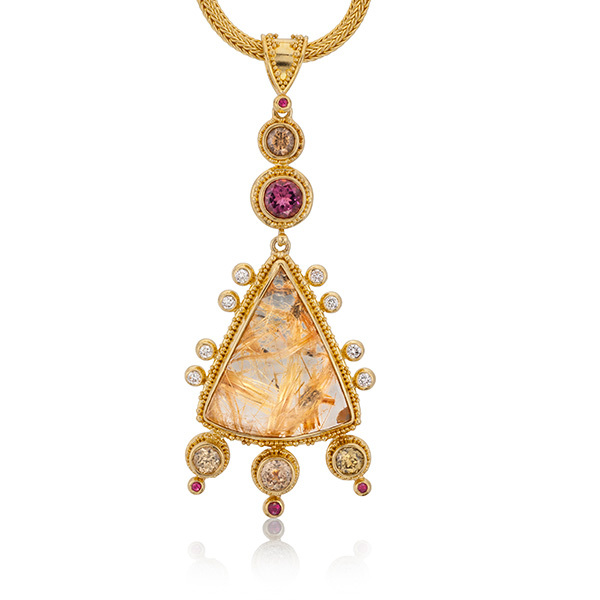 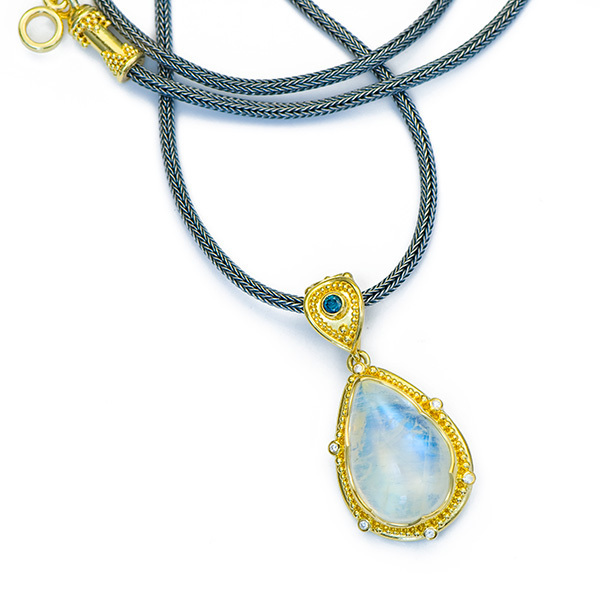 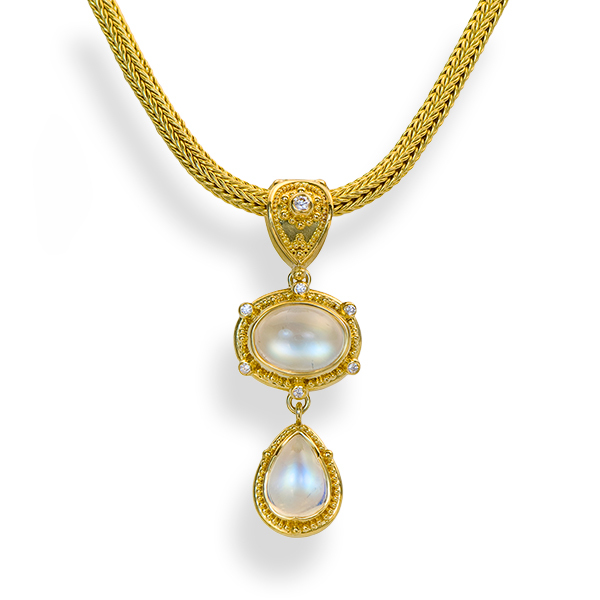 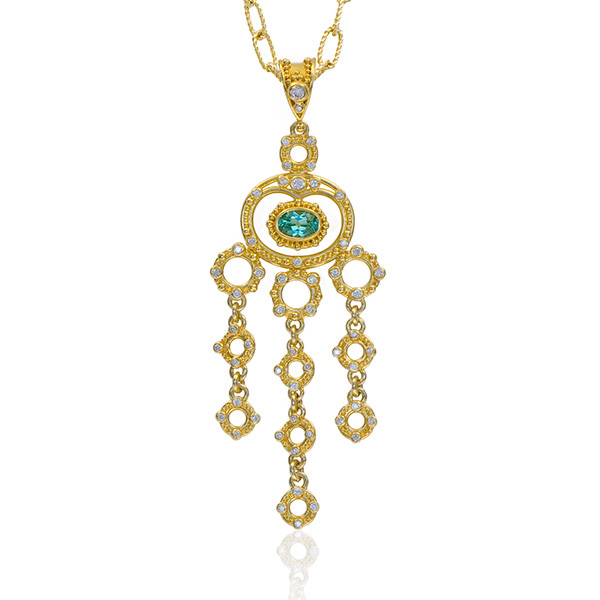 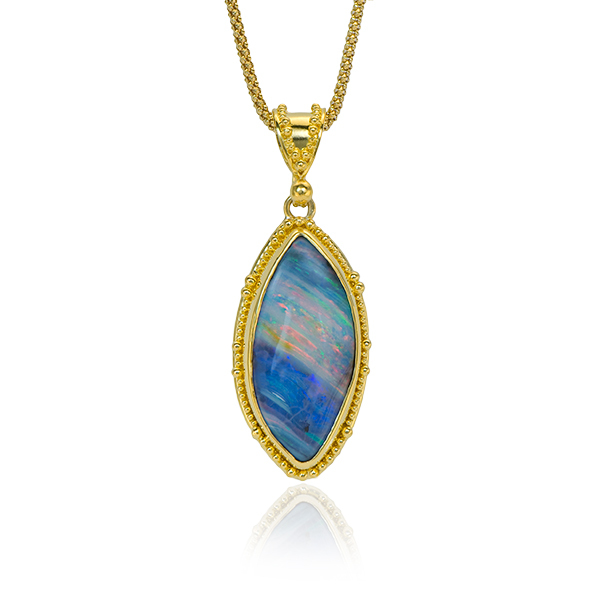 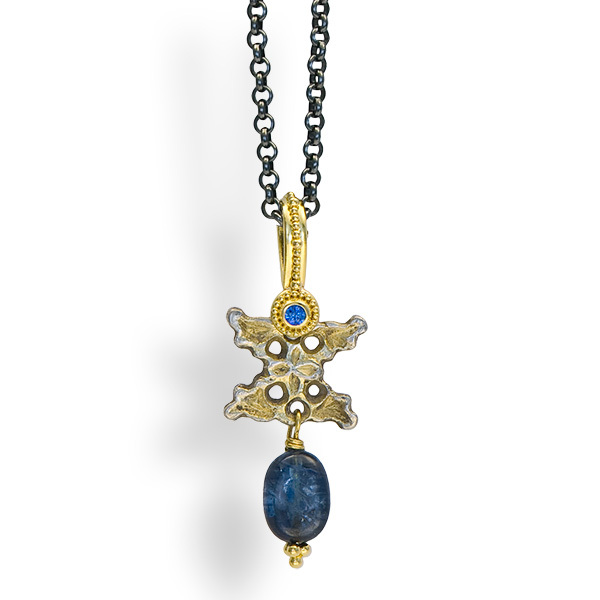 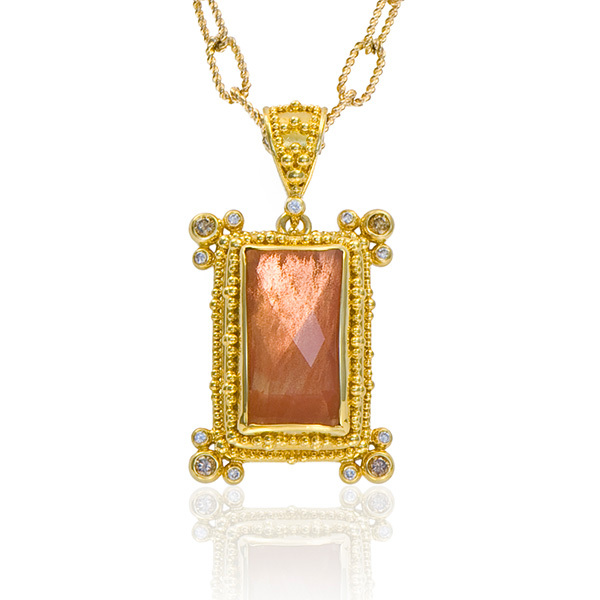 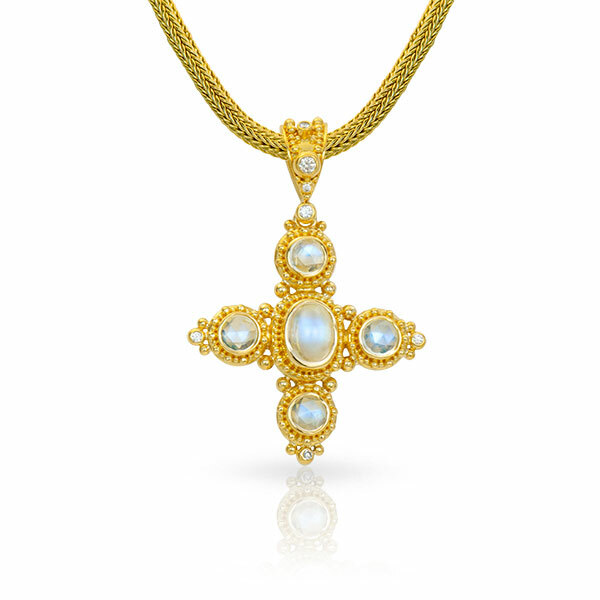 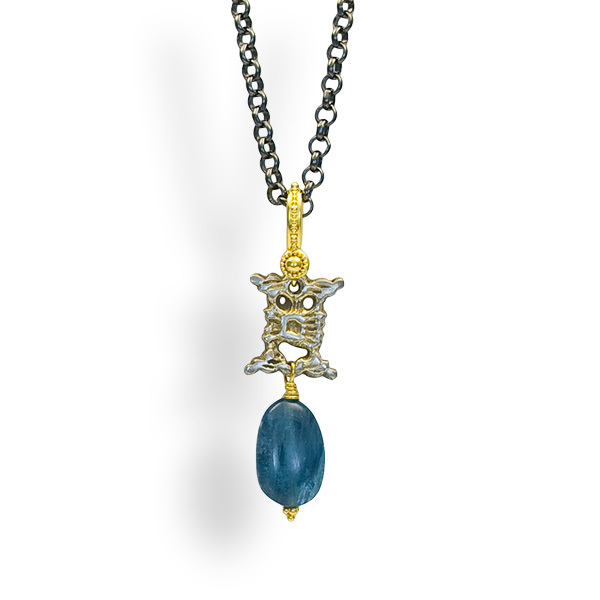 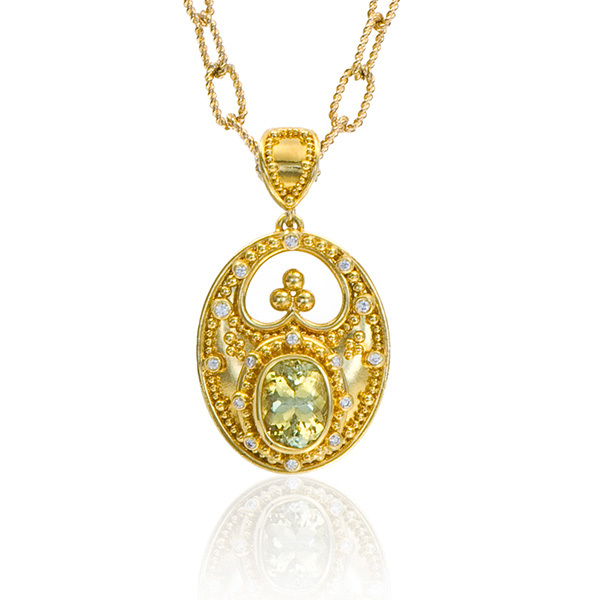 Pendant is set with Moonstones (5.31tcw and Diamonds (.10tcw) in granulated 22kt yellow gold with 18kt yellow gold. 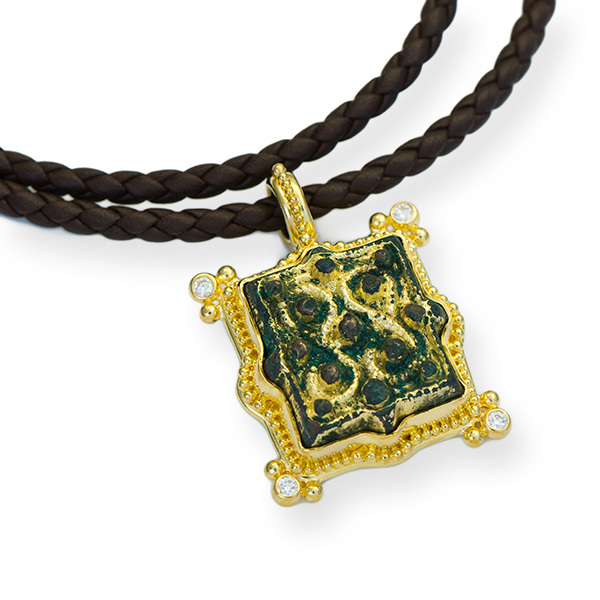 Pendant is set with two Saxon-Avar bronze belt plaques dating from the 7th-8th Century C.E. 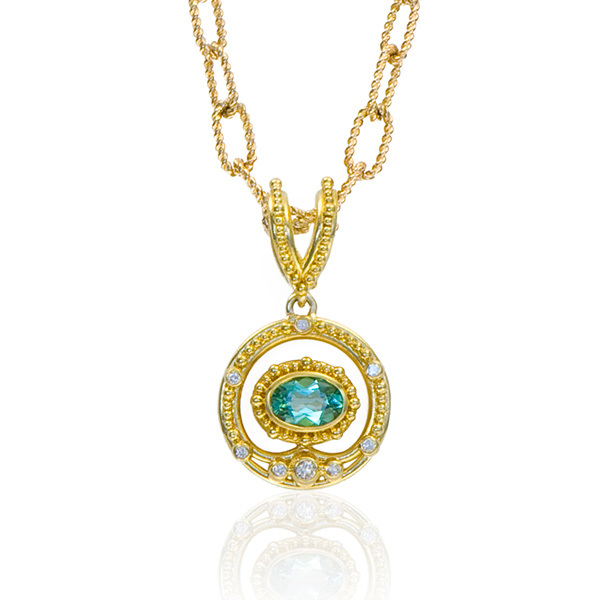 and Red Spinels (.42tcw) in granulated 22kt yellow gold with 18kt yellow gold, 5″ L x 1″ W x .25″ D.
Pendant is set with a Mint Green Tourmaline (1.63cts) and Diamonds (.11tcw) in granulated 22kt yellow gold with 18kt yellow gold, 1 1/8″ L x 3/4″ W x 1/4″ D.
Pendant is set with a Blue Moonstone (8.6 x 13.5mm, 5.25cts) and Diamonds (.25tcw) in granulated 22kt yellow gold with forged and oxidized sterling silver, 2″ L x 1″ W x 3/8″ D.
Pendant is set with a Chrysoberyl (4.62cts) and Diamonds (.15tcw) in granulated 22kt yellow gold with 18kt yellow gold, 1 1/2″ L x 7/8″ W x 1/4″ D.
Pendant is set with an Anglo-Saxon cast bronze buckle plate dating from between the 6th and 8th Centuries C.E. 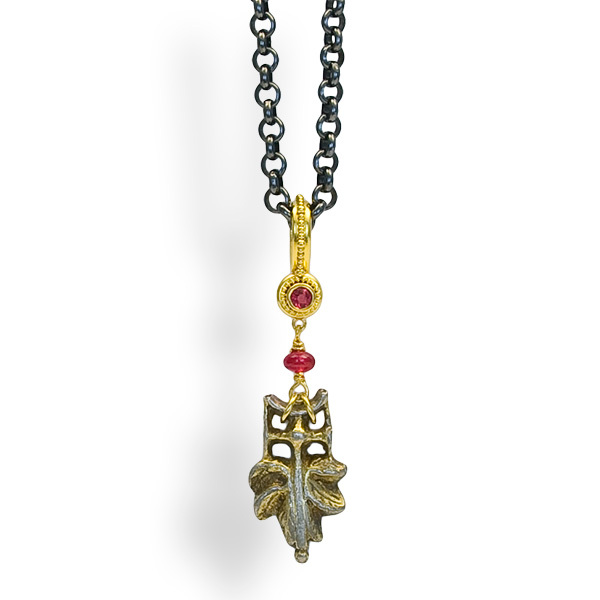 and accented with Ruby beads all set in granulated 22kt yellow gold with 18kt yellow gold, 2 1/4″ L x 5/8″ W.